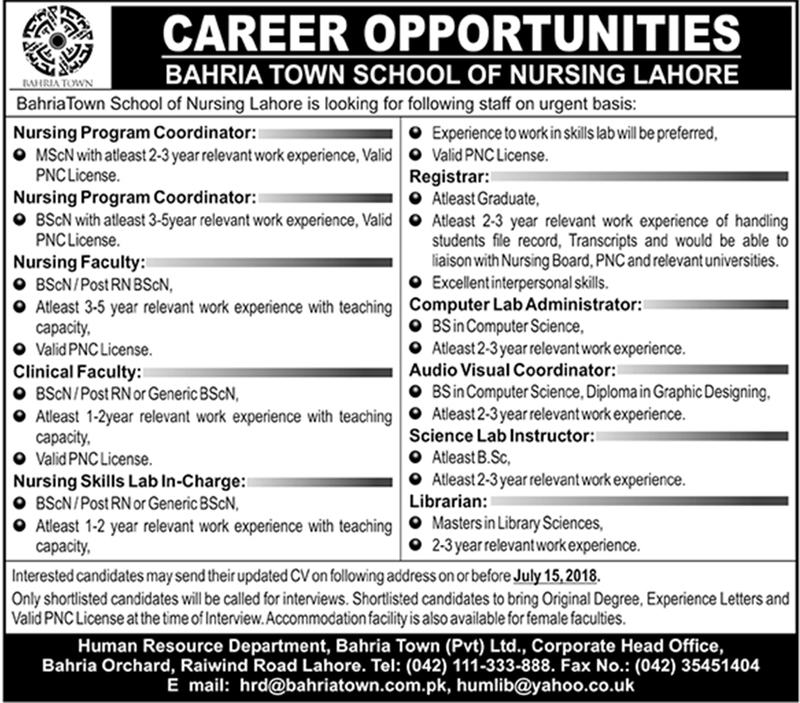 Bahira Town School Of Nursing Lahore Punjab. MScN with at least 2-3 year relevant work experience, Valid PNC License. BScN with at least 3-5year relevant work experience. Valid PNC License. BScN / Post RN BScN, O At least 3-5 year relevant work experience with teaching capacity, Valid PNC License. BScN / Post RN or Generic BScN, O At least 1-2year relevant work experience with teaching capacity. 9 Valid PNC License. BScN / Post RN or Generic BScN, O At least 1-2 year relevant work experience with teaching capacity, Experience to work in skills lab will be preferred, Valid PNC License. At least 2-3 year relevant work experience of handling students fie record, Transcripts and would be able to liaison with Nursing Board, PNC and relevant universities. At least 2-3 year relevant work experience. O At least 2-3 year relevant work experience. 2-3 year relevant work experience. Interested candidates may send their updated CV on following address on or before July 15.2018. Only shortlisted candidates will be called for interviews. Shortlisted candidates to bring Original Degree, Experience Letters and Valid PNC License at the t me of Interview. Accommodation facility is also available for female faculties.